Methods: Forty patients were randomly assigned to one of two groups: 1) Full Mouth Debridement with Clarithromycin 500mg every 12 hours for 3 days. 2) Full Mouth Debridement with placebo pills. Results: Both groups were effective for clinical and microbiological parameters. 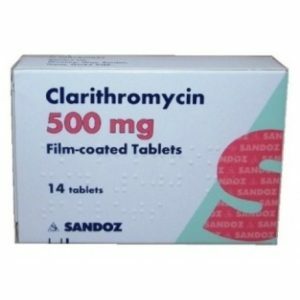 The Clarithromycin group presented with lower mean probing depths for pockets ≥ 7mm at 6 months. The Clarithromycin group also had greater reduction in P. gingivalis DNA counts at 6 months. Conclusions: Adjunctive use of Clarithromycin with Full Mouth Debridement leads to greater reduction in deep pocketing and reduced P. gingivalis counts at 6 months. Clarithromycin as an Adjunct to One-Stage Full-Mouth Ultrasonic Periodontal Debridement in Generalized Aggressive Periodontitis: A Randomized Controlled Clinical Trial. N Andere, N dos Santos, C Araujo, et al.